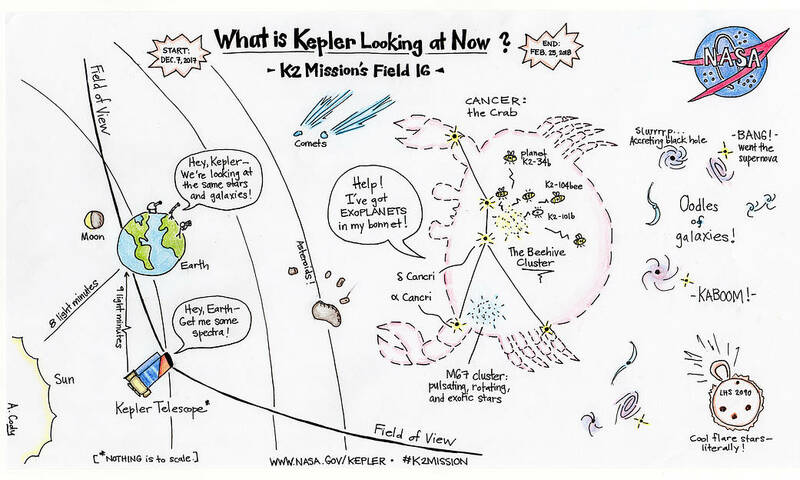 December 7, 2017 – The sixteenth observing campaign of the Kepler spacecraft’s K2 extended mission is now underway. The campaign has prospects for discoveries among 30,000 objects in the direction of the constellation Cancer. The cartoon illustrates some of the objects of interest that Kepler is observing for 80 days, from December 7, 2017 to February 25, 2018. This time around NASA has positioned the spacecraft so that it’s facing in the direction of Earth, a vantage point that brings Kepler’s field of view in line with ground-based telescopes. It will be an opportunity to simultaneously observe celestial objects from the ground and space. Among the notable efforts of Campaign 16, Kepler will begin a first-of-its-kind study of more than 9,000 galaxies in search of exploding stars, or supernovae. Kepler’s on- board camera will take a series of high-precision measurements of brightness that allow scientists to see these explosions from their very beginnings. Meanwhile, ground-based telescopes will point to this same area of sky and take the spectra, or colors coming from these explosions to explain the chemistry behind how they began. The result is a better understanding of the death of stars. Kepler will also study a couple of notable star clusters. Praesepe, nicknamed the Beehive Cluster, is a collection of young stars that have been a rich source of exoplanet discovery and may yet yield more. This cluster may also help answer basic scientific questions about how stars spin. The nearby M67 star cluster is intriguing because the age and chemical composition of this cluster is similar to our sun and may help explain the history and evolution of our solar system. Astronomers are having a look at the pulsations of these stars, known colloquially as ‘solar quakes,’ to understand their interior structures. In addition, during the first three days of the campaign, Earth and the Moon will cross Kepler’s focal plane. In what has become a tradition at NASA of taking photos of Earth from far-flung spacecraft; Kepler will spend 30 minutes on December 10 from 2:38-3:08 p.m. MST snapping a full frame image of our home planet. No other habitable planet is known. The picture will not show a high level of detail of Earth’s surface, rather it will appear as a large, blurry ball moving across the field of view, similar to the image of Mars that Kepler collected earlier this year. This event is expected to help scientists better understand and adjust for the ways Earth’s luminous presence in the skyscape affects the data retrieved by the telescope, besides being another moment to reflect on our planet’s place in the cosmos. Kepler’s community of researchers and fans are recognizing the event in social media as #WaveAtKepler. Yet, the image will not be available until the entire set from Field 16 is downloaded at the end of the campaign, which is expected to be available in the late spring. NASA’s Ames Research Center in Mountain View, California manages the Kepler and K2 missions for NASA’s Science Mission Directorate. NASA’s Jet Propulsion Laboratory in Pasadena, California, managed Kepler mission development. Ball Aerospace & Technologies Corporation operates the flight system with support from the Laboratory for Atmospheric and Space Physics at the University of Colorado in Boulder.